I love making what I call pantry meals and when I can make it in my slow cooker its a win win! The next best thing is being able to make it into another dish! 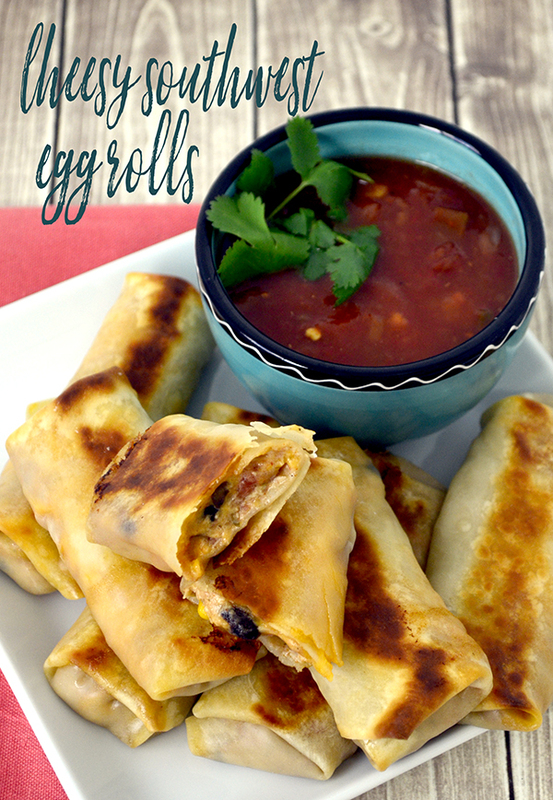 I took this Slow Cooker Creamy Chicken Chili and turned them into Cheesy Southwest Egg Rolls! I have a lot of information for you today and I have an easy and useful Kitchen Hack too! 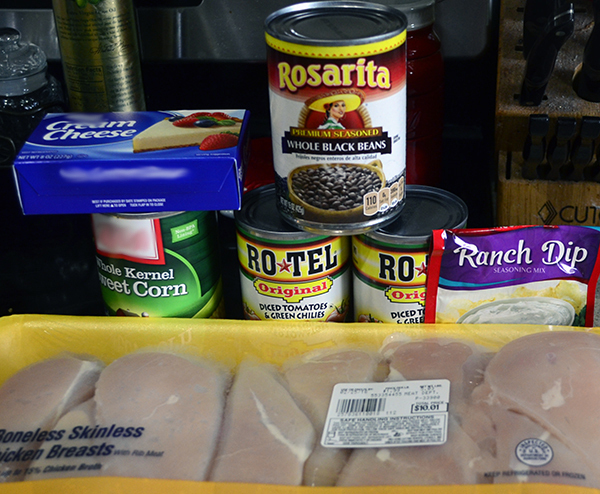 I first started with an easy and delicious White Chicken Chili slow cooker recipe! I love these recipes because its a fix it and forget it kind of meal! Using my pantry to “shop” for my ingredients I got the Chili started. That’s it put it in your slow cooker and let it cook! Spray inside of 4-quart slow cooker with cooking spray. 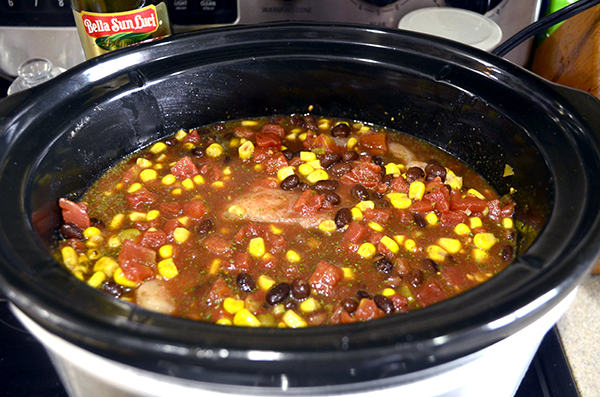 Place undrained tomatoes, beans, undrained corn, ranch mix, chili powder and cumin in slow cooker; stir to combine. Add chicken and cover with tomato mixture. Cover and cook on HIGH 4 hours or LOW 6 hours, until chicken is tender. Pull chicken into shreds with 2 forks. Cut cream cheese into 8 pieces; stir into chili until melted and combined. Top each serving with cilantro and avocado, if desired. 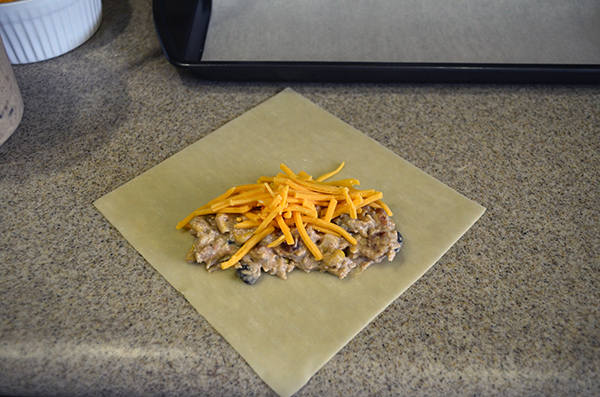 Place two heaping table spoons of cold Creamy Chicken Chili in egg roll wrapper on the diagonal. Add a generous tablespoon of cheddar cheese. 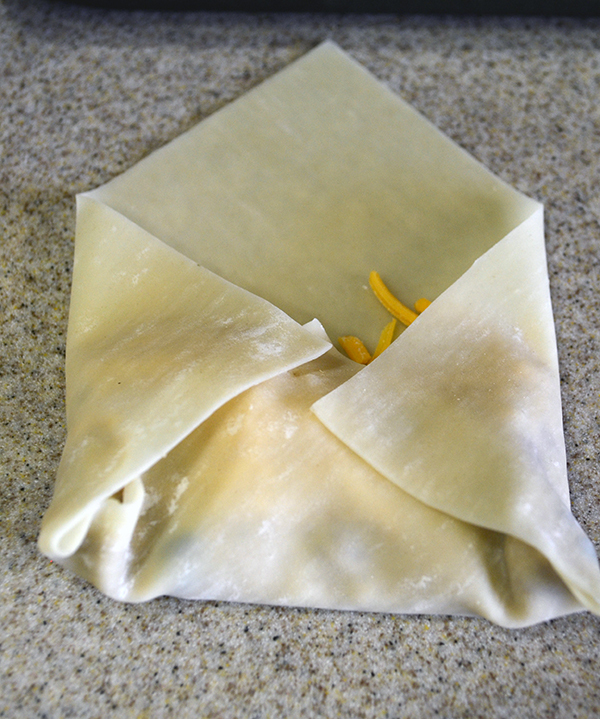 First fold in the lower triangle of the wrapper then fold the sides over and roll sealing the egg roll with a bit of water on the tip of the opposite corner. Place on baking sheet and brush with olive oil. Bake at 400 degrees for 8 minutes then turn over and bake for another 5 mins. Serve with your favorite salsa or sour cream! I have to tell you that it can be kind of hard to shred the chicken especially when its hot so I have a little trick I use to shred chicken! I use my stand mixer! That’s right I use my stand mixer! It makes it so easy just take a peek! See how easy that is now it goes back in the chili with the cream cheese stir until the cream cheese is melted and enjoy! 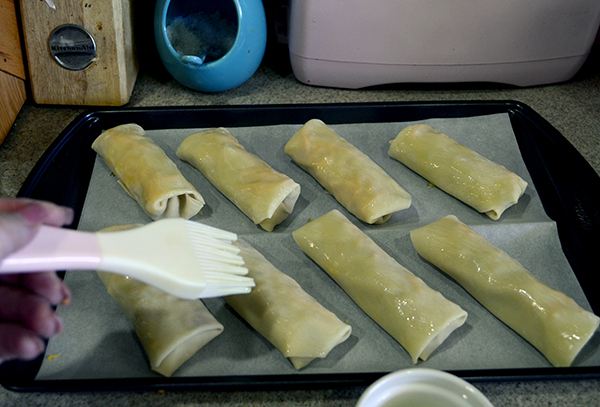 Now were not done here because I am sure you want to know how to make those Cheese Southwest Egg Rolls right? 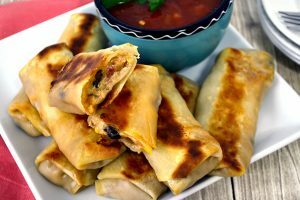 Well I used my leftover Chili, cheddar cheese, egg roll wrappers and some olive oil and you can make easy and delicious egg rolls! It so easy! Place on baking sheet and brush with olive oil. Bake at 400 degrees for 8 minutes then turn over and bake for another 5 mins. Serve with your favorite salsa or sour cream! These are sooo good you will not be able to eat just one! 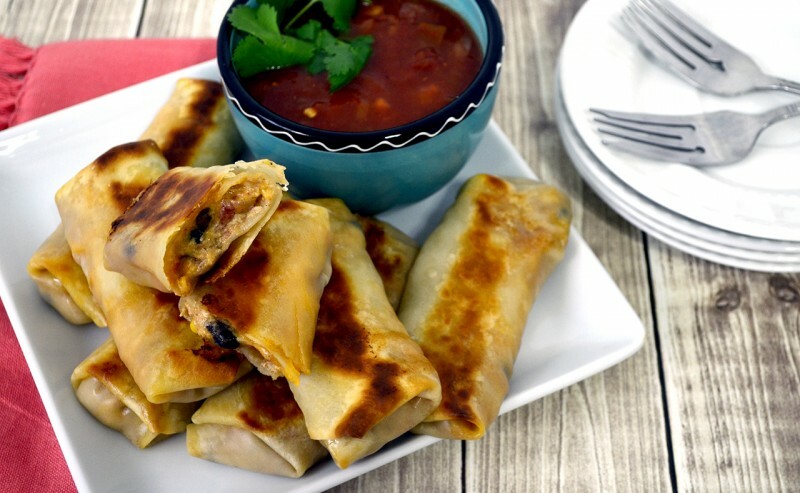 Serve the egg rolls with my easy salsa and you have a great dish! 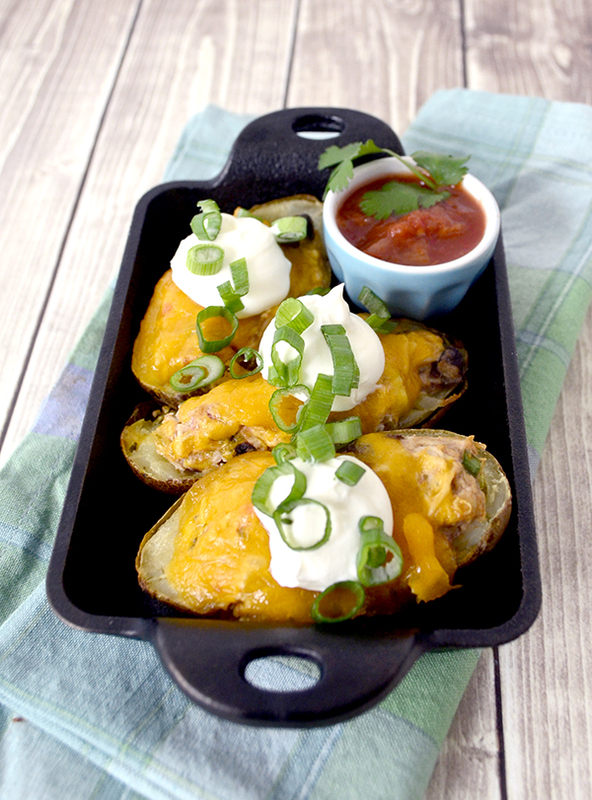 Another way to enjoy this Creamy Chicken Chili is as Southwest Green Chili Potato Skins! These are so easy too and so yummy! I added a can of chopped green chilies and some fresh sliced green onions to the Creamy Chicken Chili and its ready to go into potato skins! 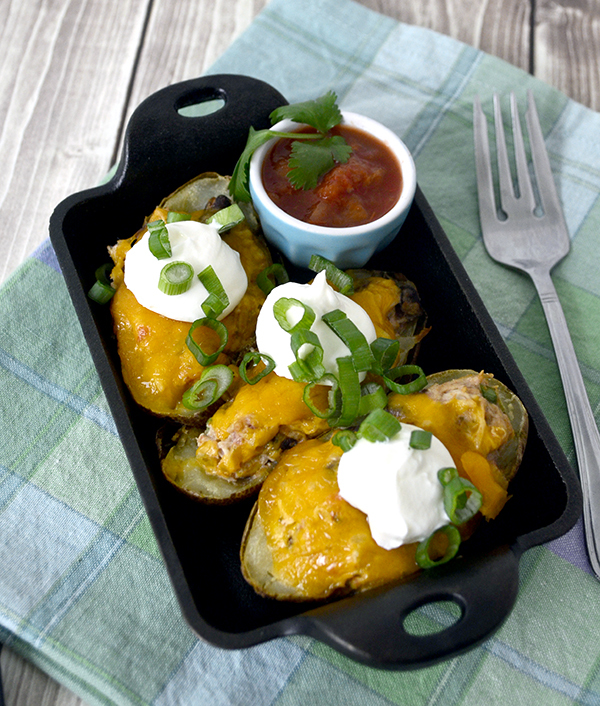 Simply bake your potatoes and scoop out the middle add a heaping spoon of chili cover with grated cheddar cheese and bake until the cheese is melted! Top with sour cream and serve with salsa and your good to go! 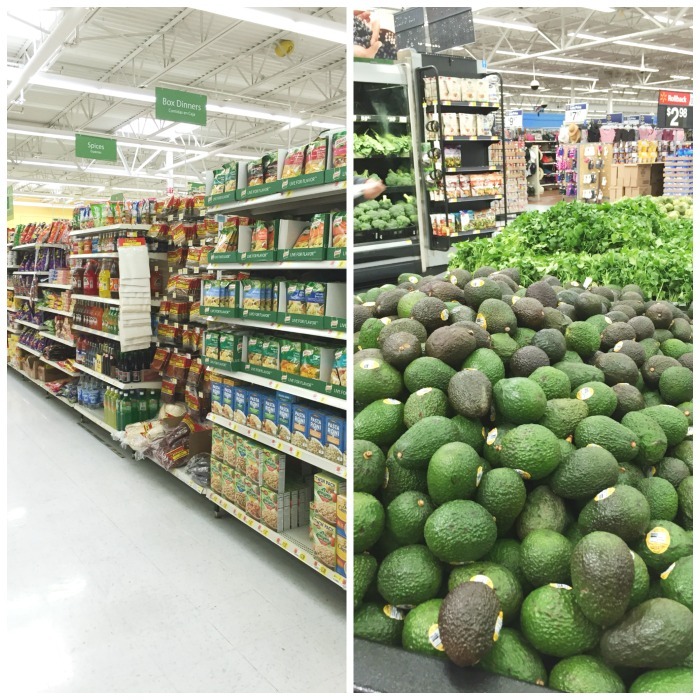 I love that I can find all my ingredients at my local Walmart! Find more easy to make recipes that are perfect during the cold winter months by visiting this link: Yes You Can Recipes! 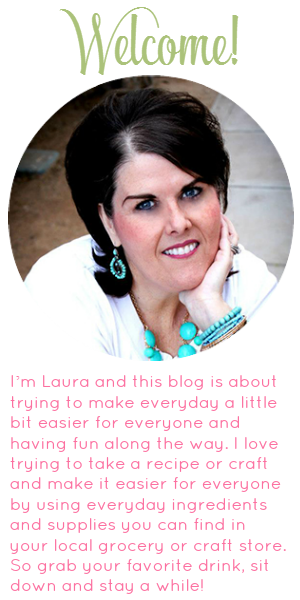 Visit Laura~Pink Cake Plate's profile on Pinterest. Subscribe to Pink Cake Plate Emails!